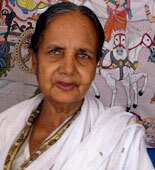 Sabihar Banu is 82-years-old but her artistic bent and firm hands keep her going. She received a national award in the year 2004 from Dr APJ Abdul Kalam and since then there has been no looking back. She learned her art from her mother and grandmother and started practising it since the age of 12. She made a village scene on a four by four metre length of cotton cloth, working on it from 1995 to 1998 and this won her the national award. The national accolade opened several doors for her to display her skill and impart the same to many. The union government set up a training centre wherein even today she teaches a group of students around 15-20 students once in a year. Sabihar has participated in several exhibitions mainly in Kolkata, Delhi, Haryana, among others. She has also participated in exhibitions abroad - Italy, Canada, France and Germany receiving appreciation wherever she went.